Join the Aspen Institute for a film screening of “Capturing Grace” and conversation with the film’s Director, Dave Iverson, and “Dance for PD” Director David Leventhal, in conversation with Aspen Institute Arts Program Director Damian Woetzel. 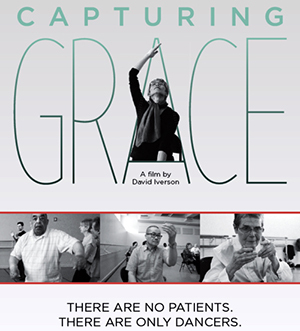 “Capturing Grace” is a story about two realms: one occupied by some of the most acclaimed modern dancers in the world; the other inhabited by a group of people with Parkinson’s disease. This film is about what happens when those worlds intersect. For the director, Dave Iverson, who was diagnosed with Parkinson’s eight years ago, it’s also a personal story. Chronicling “Dance for PD®,” the Mark Morris Dance Group’s unique partnership with the Brooklyn Parkinson Group, Iverson chronicles a remarkable community of people and a rediscovery of grace. “Dance for PD®” has emerged as an innovative global program that has launched in more than 100 communities in 11 countries. “Dance for PD®” Program Director David Leventhal and Dave Iverson will speaking with Arts Program Director Damian Woetzel for a post-screening conversation.